The spec of this Anthem is quite incredible and includes support for UHD Blu-ray, 4K60 through HDMI 2.0a, HDR, Dolby Atmos, DTS:X, and much more, all optimised for optimum sound quality, making this one of the finest and most audiophile friendly AV processors on the market. Earn 3895 loyalty points when you order this item. Anthem's AVM 60 preamp processors offers rare innovation and performance with features including Dolby Atmos immersive audio decoding, upgrade for DTS:X, UHD Blu-ray and 4K60 through HDMI 2.0a with HDR. Also included is HDCP 2.2 and 18.2 Gbps allowing switching for compatibility with the latest video formats. For greater audiophile appeal, the unit includes a toroidal power supply, premium differential output DACs with 32-bit conversion and sampling rate optimized filters for hi-res sound. Premium A/D converters with 106dB signal to noise ratio ensures the highest quality sound when using analog sources. DTS Play-Fi offers easy-to-use music playback from popular streaming services and locally networked sources controlled through iOS, Android or PC apps. Anthem Room Correction quickly “corrects” the effects that reflective surfaces such as walls, floors and ceilings have on the sound radiating from a loudspeaker, allowing your audio equipment to achieve a more natural sound in any room, as close to lab standard as possible. On a more complex level, ARC is a proprietary digital signal processing software that works with a specially-engineered calibration microphone and your PC to quickly and easily optimize audio for your unique listening space. The ARC Kit is easy to use, and just a few simple steps can customize your loudspeakers for your unique listening space. Plug the kit’s custom Calibration Microphone into your computer and into your ARC-ready Anthem A/V receiver. Place the microphone at each of the listening positions in your room and allow ARC to take a sound sample from each location. Then its sophisticated DSP accurately equalizes response and creates intricate crossover curves so that the performance of the speakers in your room meets the ideal lab standard. 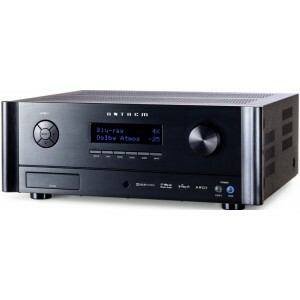 Anthem’s AVM 60 with DTS Play-Fi technology is the perfect high performance means of delivery, it can take full dynamic advantage of the better-than-CD-quality sound quality delivered by the DTS Play-Fi streaming technology. Partnered with the leader in Wi-Fi streaming, DTS Play-Fi wi-fi streaming technology supports a host of high quality file formats. Controlled directly from your smart device or computer in any operating system, the “Open Ecosystem” of DTS Play-Fi technology makes it easy to stream music throughout your home from any device, Android or iOS mobile or PC, and to add more wireless streaming devices on the fly. Electrical noise in audio is often generated due to the connection with other AV components and due to the connection between the preamp-processor and amplifier, as well as from other sources of external noise. To ensure the AVM 60 is not affected by this distortion, it uses True-Balanced XLR Pre-Out connections to achieve a balanced transmission that is highly noise resistant. Firmware updates can be easily installed through a hardwired ethernet connection or through a wirless connection. Dolby Atmos is a revolutionary new audio technology that transports you into extraordinary entertainment experiences. Fills your room with captivating sound that comes from all directions including overhead to fill the room with astonishing clarity, richness, detail, and depth. The specific sounds of people, music and things move all around you in multidimensional space, so you feel like you are inside the action giving artists new capabilities to tell their stories, accent their games, or perform their music to achieve the greatest expressive impact. Dolby Atmos is the first home theater system that is based not on channels but on audio objects. Whether in the cinema or the home theater, it has the intelligence to determine what speakers to use to precisely recreate movement in the way the artists intend. They can now precisely place and move sounds as independent objects in multidimensional space, including anywhere overhead, so you can hear them as you would naturally. Dolby Atmos helps weave the audio story to match what’s happening on the screen. DTS:X is the next generation audio codec from DTS that leverages object-based audio to enable new audio experiences in immersion and interactivity. DTS will playback all DTS formats including DTS Digital Surround and DTS-HD Master Audio. An audio object is the combination of the waveform where captures the audio, and metadata which represents the spatial location in which the object should be heard. Audio objects free content from specific speaker layouts for optimal listening. Because DTS:X doesn't require any specific speaker layout, you can arrange your home theater system however you want.